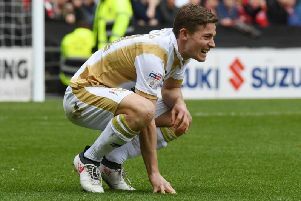 Keith Andrews is on the verge of returning to MK Dons, Karl Robinson confirmed this morning. The former Ireland international captained Dons to both the League 2 title and the Johnstone’s Paint Trophy in the 2007-08 season before joining Paul Ince at Blackburn Rovers that summer. Currently on loan at Watford from Bolton Wanderers, Robinson confirmed that terms had been unofficially agreed with both clubs, and with the 34-year-old ahead of a move they hope to complete in the next 24 hours. “We had a meal, me him and his wife, on Tuesday and we’ve spoken to Watford, and Bolton,” he said. “We’ve unofficially agreed terms. Andrews joined Dons in the summer of 2006, penning a deal with Martin Allen from Hull. Establishing himself as a first team regular at the National Hockey Stadium, Andrews took over the captain’s armband a year later under Ince’s leadership. Andrews scored 14 goals from midfield in the double-winning season, including memorable strikes against Peterborough at London Road, at Stockport to secure promotion, and at Wembley in the JPT final, earning himself a move to the Premier League. He has since played for the Republic of Ireland, and was voted Ireland’s Player of the Year in 2012 after being their stand-out performer during a disappointing Euro 2012 campaign. In recent years, Andrews has moved to West Brom and Bolton, while having loan spells at Ipswich, Brighton and Watford. His imminent arrival though could be seen as a precautionary move from Dons, should a big money offer come in for fellow midfielder Dele Alli. This, however, is something Robinson was quick to deny. He said: “He’s not a replacement for Dele, far from it. We’re looking at different systems to play.